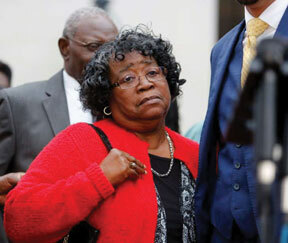 Walter Scott’s mother listens to the press conference after the mistrial was declared for the Michael Slager trial Monday Dec. 5, 2016, in Charleston, S.C.
A jury’s failure to convict former North Charleston police officer Michael Slager in the fatal shooting of Black motorist Walter Scott is a “disappointing delay in the delivery of justice,” the NAACP said Tuesday. A judge in Charleston declared a mistrial Monday after a jury deliberated 22 hours over four days without reaching a unanimous verdict. Slager, 35, testified he feared for his life when he shot Scott, 50, in the back as he fled a traffic stop in April 2015. Slager said Scott tried to wrest away a Taser moments before the shooting, which a bystander recorded on his cellphone. “Scott, a forklift operator who served in U.S. Coast Guard, lived a life worth far more than a hashtag or statistic,” NAACP President Cornell William Brooks said in a statement Tuesday. Prosecutor Scarlett Wilson said Slager will be retried. Slager, who was fired and charged with murder days after the shooting, is also awaiting a federal trial on civil rights and other charges. “Despite this setback, the NAACP will continue to advocate for a just and decisive conclusion to Slager’s case and fight for substantive, comprehensive criminal justice reform,” Brooks said. Sen. Tim Scott, R-S.C., is-sued a statement Tuesday, saying he can “understand and sympathize with the frustration and heightened emotions that some folks are experiencing.” But he urged everyone to trust the judicial system. Family lawyer Chris Stewart called the mistrial a ”missed opportunity” to begin the process of racial healing in America. Scott’s mother, Judy, said she remained hopeful Slager would be convicted and punished.